This is my first gingerbread house. 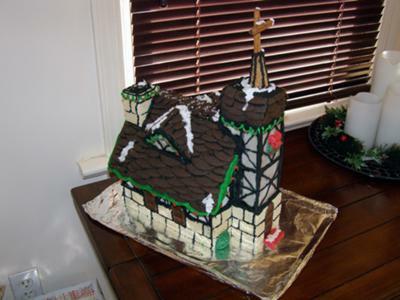 I tried to make it look like it after a church building in my wifes Dicken's village. Love the roof top with the fallen snow. Your wife must be a lucky girl. Great job,can't wait to see next years.Maybe Bob Crachets' house? Wow. What a fabulous job for a first effort. Very well done.